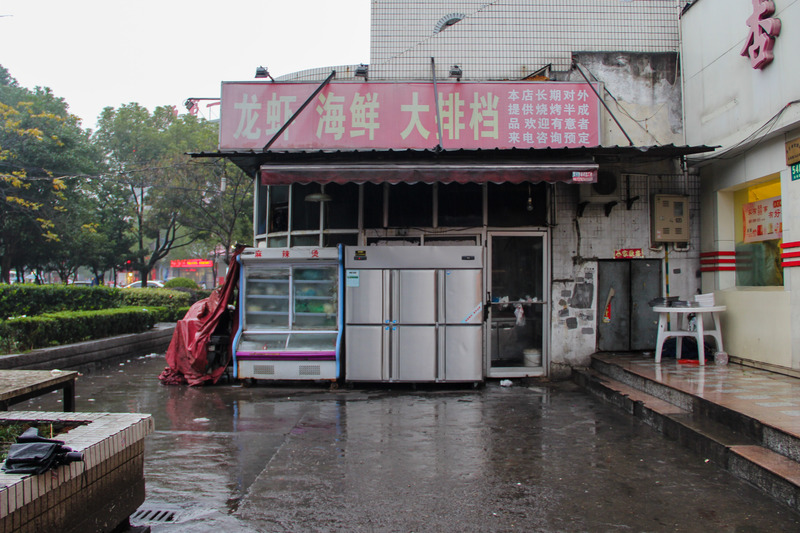 As a group we claimed the JinQiao area from the very beginning as we eat street food every night and having the area that encompassed the vendors we interacted with on a daily basis would allow us to gain insightful and accurate information. When the time for the interview came we more or less knew who we wanted to interview, and just had to choose the vendor who had the best story to tell and would be the most willing to help us through the project. Our first choice in vendors was a group of three brothers from Inner Mongolia. 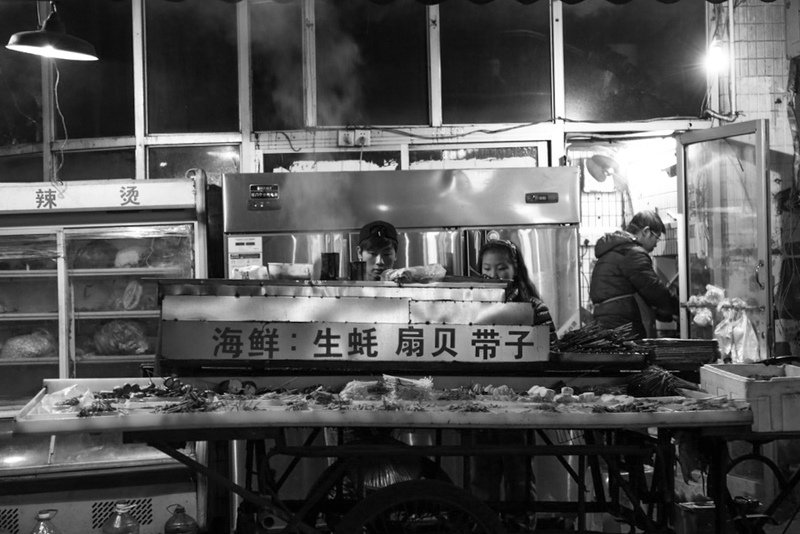 However not everything in life works out the way we want, and the person we were planning to interview, the one brother who did speak Mandarin was not there the day we planned on doing the interview, so we went with our second choice – a 高 family selling skewers. 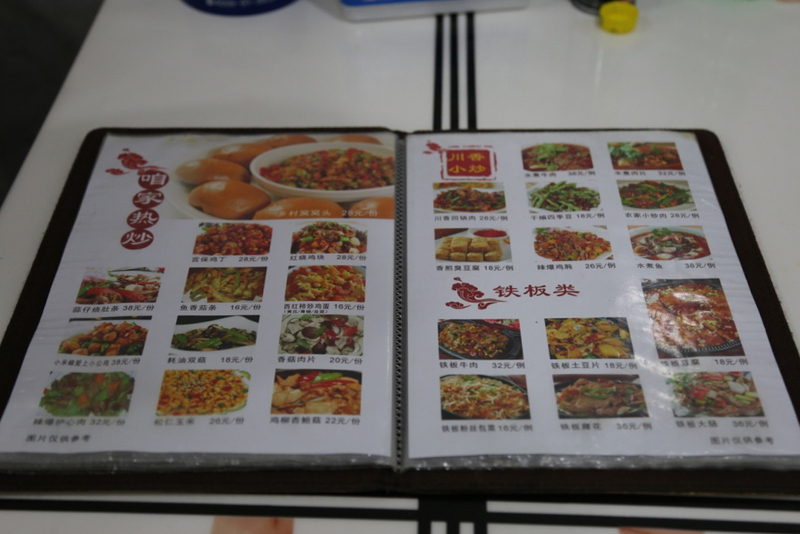 (In case you are not very familiar with Chinese street food, you’ll find the following section useful) Everything happens for a reason, and the second choice turned out far better than we ever could have imagined. 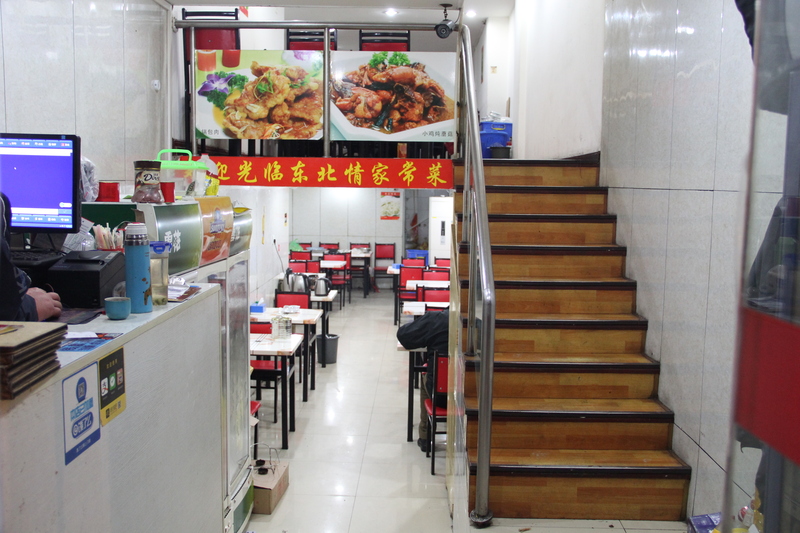 Through the process we discovered that there was quite a deep backstory to this family and decided to dig deeper, tracing the story of their business: why they came to Shanghai, specifically Pudong, and when, as well as why they decided to sell chuar, how profitable it is and what their future plans are in the food industry. Simple snack with many variations, originated as Yangrou chuan/羊肉串 (Lamb Skewer). 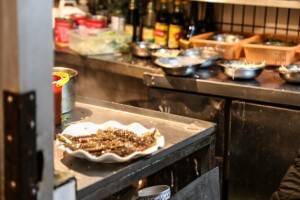 串儿 are bite-size bits of meat/vegetables/tofu/fish/anything you can imagine skewered on bamboo/wooden stick, covered in a mixture of grounded spices, such as cumin, chili, salt and grilled over coals. 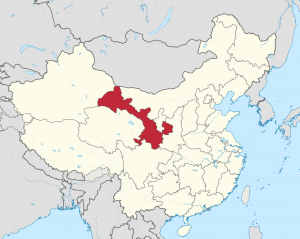 It originated in Xinjiang Province in the northwest of China (a province neighboring Gansu Province, where our vendors are from), and recently spread throughout China as a popular street food. 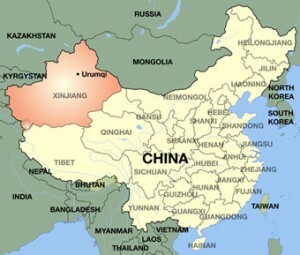 It reflects traditions and preferences of Central Asia and Uighur people. 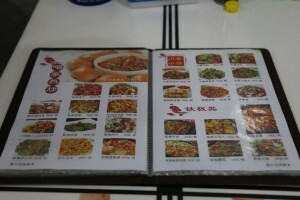 串儿 is in pretty much any “must try in china” lists, check this one out and find out what else you should try in Shanghai. 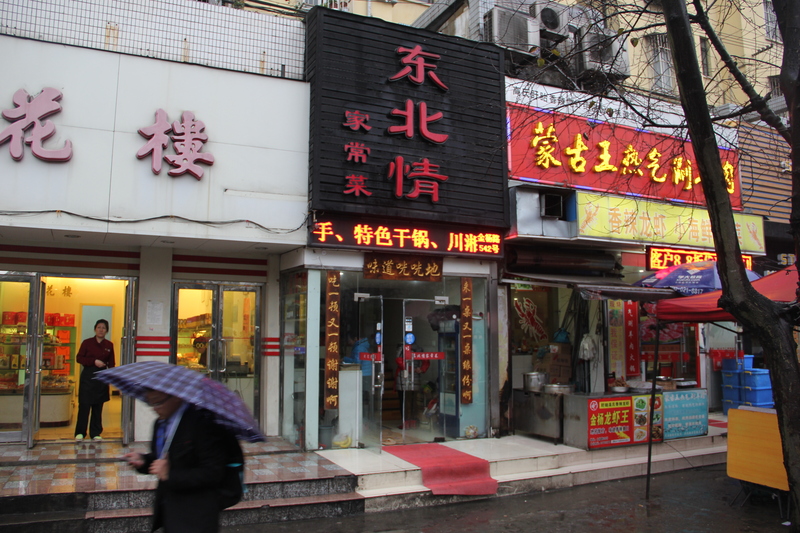 Also, if you don’t have a chance to go and get an authentic 串儿, you can make one at home. Here is a recipe for delicious spicy lamb skewers! 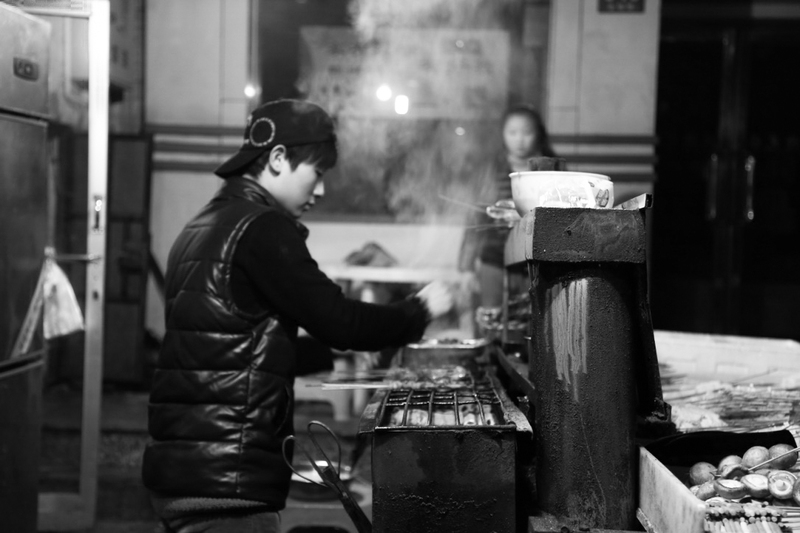 The street food 串儿 business we are looking at is operated by a whole family. It consists of a married couple (grandparents) and their two sons. Older son has a wife and small child. 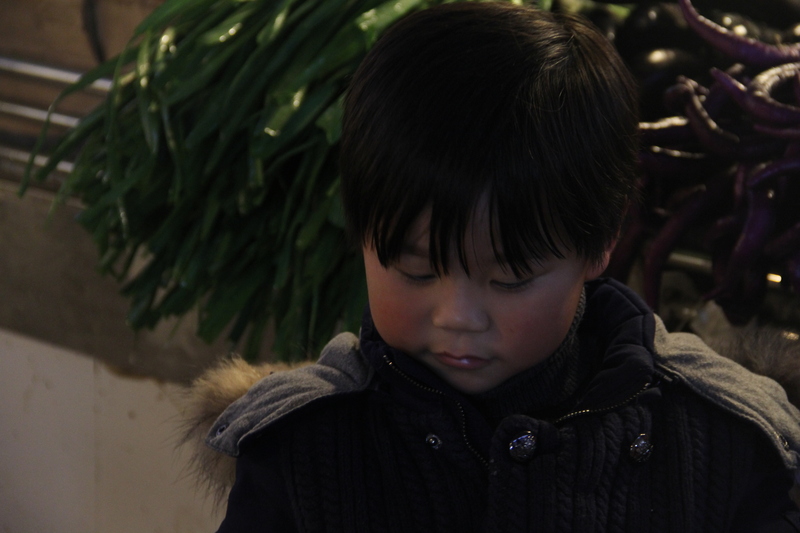 This family began their migration to Shanghai in 2001, 14 years ago. Their friends who had successfully made the transition into street food vendors in the city told the family that it was possible to make a living there. Leaving their home province of Gansu behind in hopes of creating a better life for themselves and their family, the Grandparents, as we will refer to them, left their 2 children behind with the great grandparents (their parents) while they created a foothold in Shanghai. They sold everything that was not completely essential to them and created a small fund with which they would start their new lives. 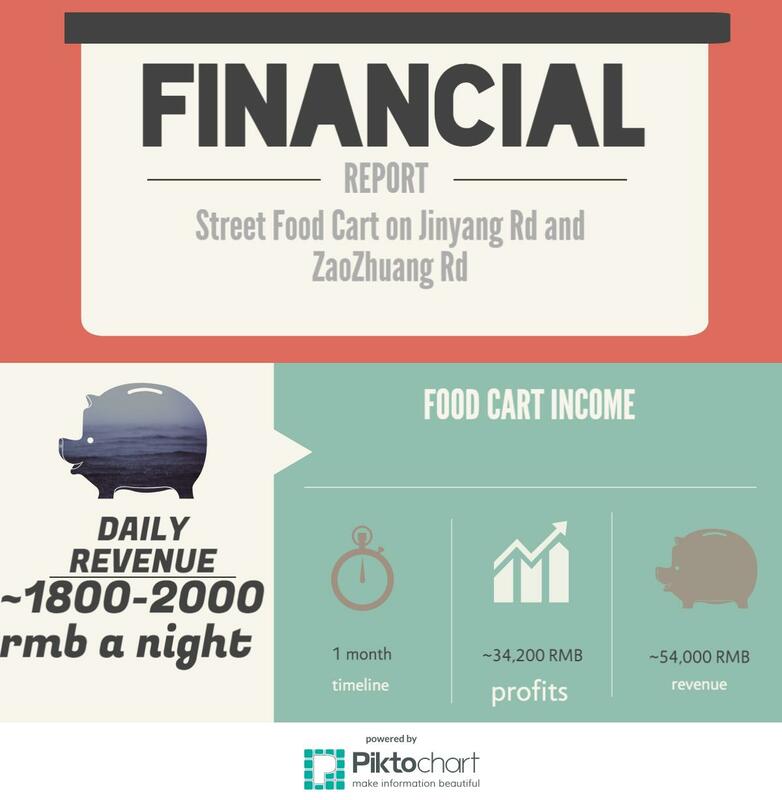 With this money they purchased their first cart, a 1,200 RMB combined chuar grill, bicycle and food display table. Cart with bicycle, grill, and display table that they have now. They settled in the Jinqiao area, where we met them, about 4 years ago but have been selling chuar in Pudong since they have been in Shanghai. 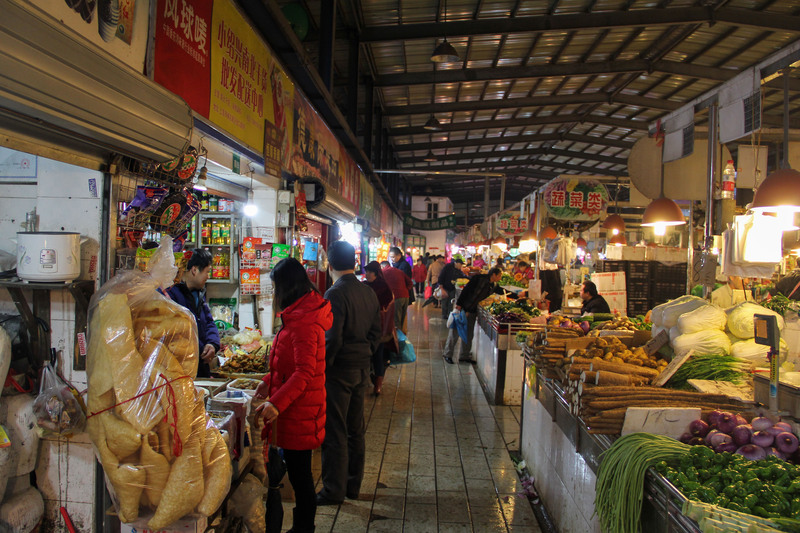 They knew they wanted to be in Pudong because they could see that this is where the growth in the city was coming from and the market for street food was not as saturated as it was in Puxi. 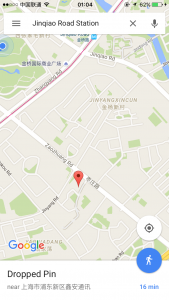 What is more, they told us that one of the other reasons why they chose Pudong is because it has a lot of residential communities, so it wasn’t that difficult for them to find the customers, as long as they put their cart in front of an apartment complex. As the city grew they moved out of the city center to where the residential areas popped up. They sent money home when they could and visited their children during the holidays. After being in the city for about a year they brought their kids into the city to live with them. 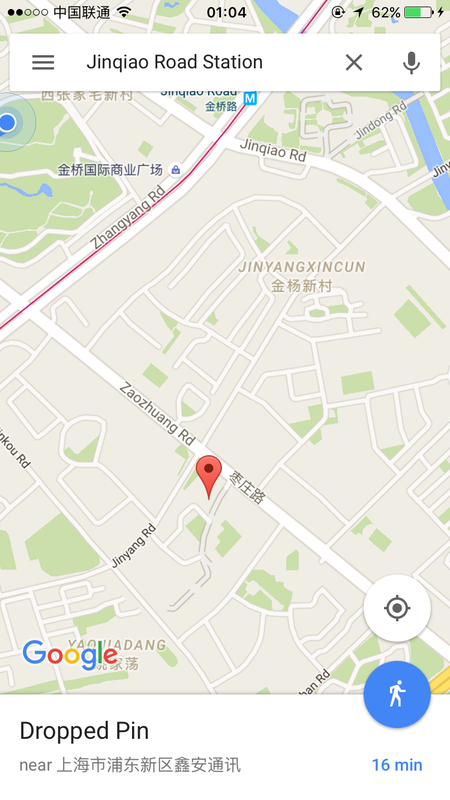 They were very ambiguous from this time period up until their move to the current location at Jinqiao. During this time period we do know that the eldest son did marry and had a boy who is now 5 years old. After 2 years of working at their current location they had saved up enough money (combined with previous savings) to buy the empty space directly adjacent to where they had been selling chuar. 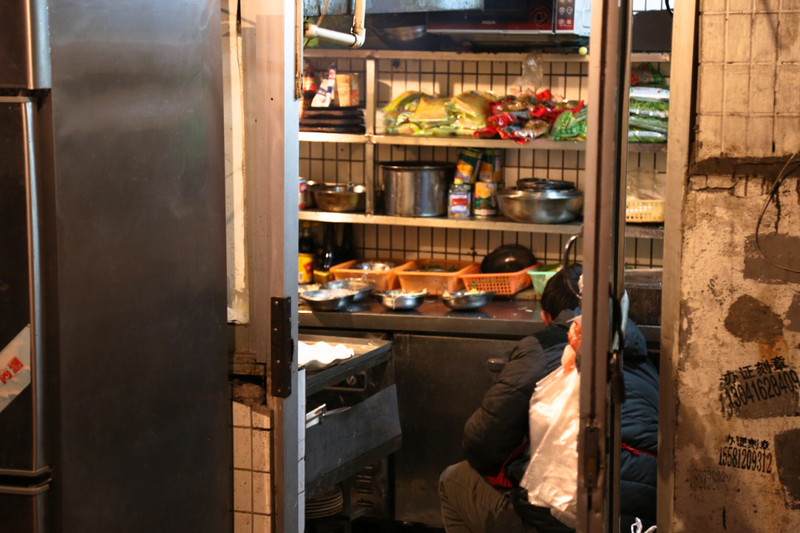 They had originally been renting a very small room to store excess food in a freezer as well as long lasting ingredients such as garlic and decided it was time to branch out from the food cart and open up a restaurant. They continue to rent the freezer space as well as a two story restaurant space and a kitchen. 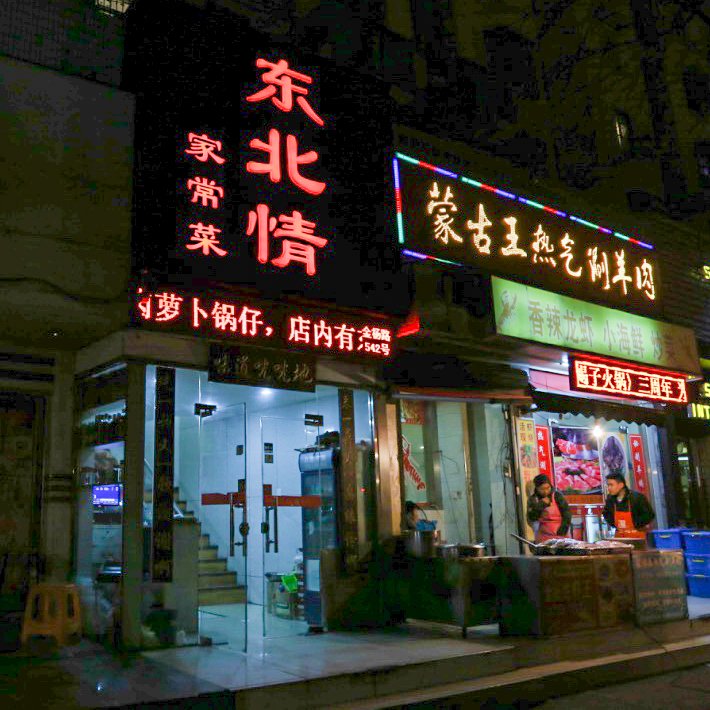 Since the purchase of the restaurant, the youngest son has been working part time, he spends the rest of his time self studying Mandarin and he is now able to fluently read and write, although he continues his studies everyday. 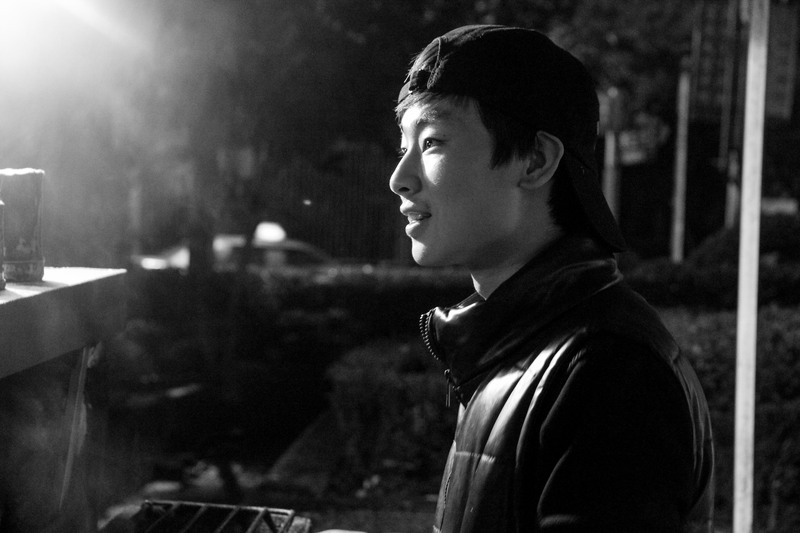 He is the only member of his family that is able to read write and speak fluently. Each member of the family has their jobs to do. The grandmother has arguably the most important job of the entire family, she is tasked with waking up at the crack of dawn and heading off to the market to get there by five so that she is able to get the best ingredients each and every morning. Her tireless work is apparent when you look at the food that this family is selling. 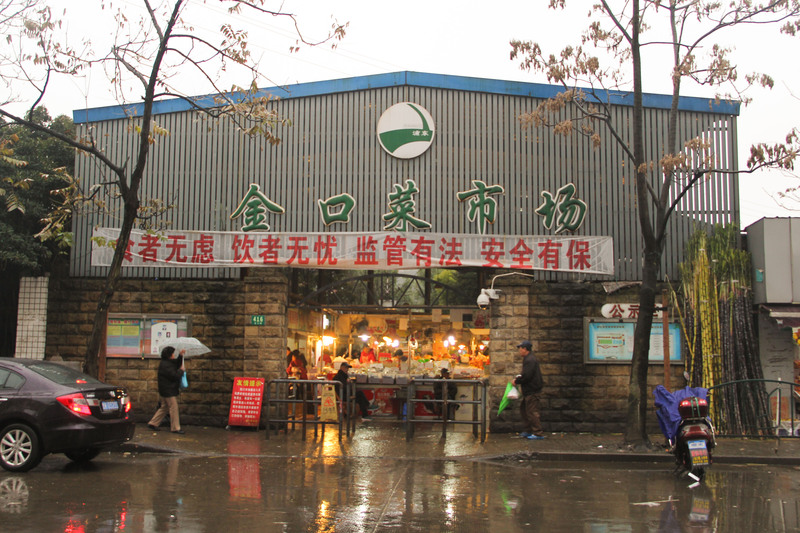 Where many chuar stands sell limp and average sized vegetables or tendon filled meat, this stand is completely different. By being the first at the market every morning the grandmother is able to pick out the choice ingredients, and because of their industrial refrigerator and freezer and the restaurant they have, the turnover rate for ingredients is extremely high, much higher than that of most chuar stands causing their ingredients to always be fresh. The grandfather oversees the restaurant during the day and at night assists his youngest son in cooking the chuar. On occasion, when his grandson is at the restaurant you will see him playing with the child or teaching him. 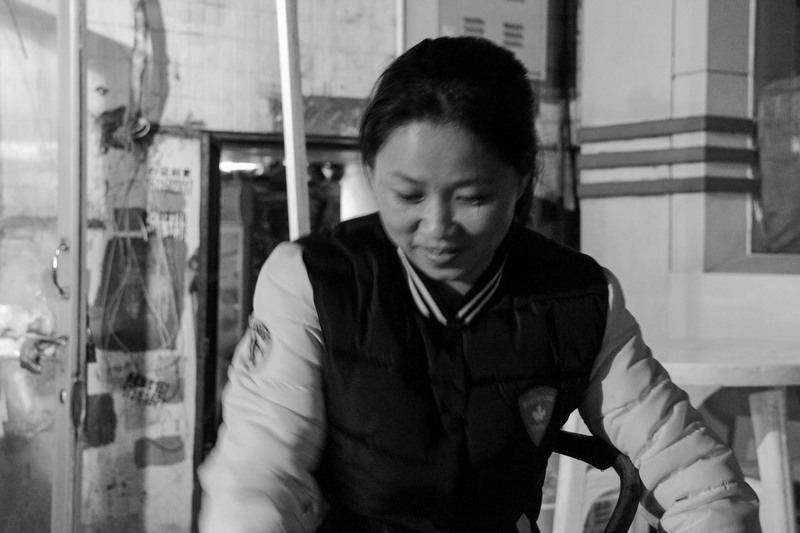 The wife of the eldest son runs the restaurant and oversees the ayis that also work at the restaurant. 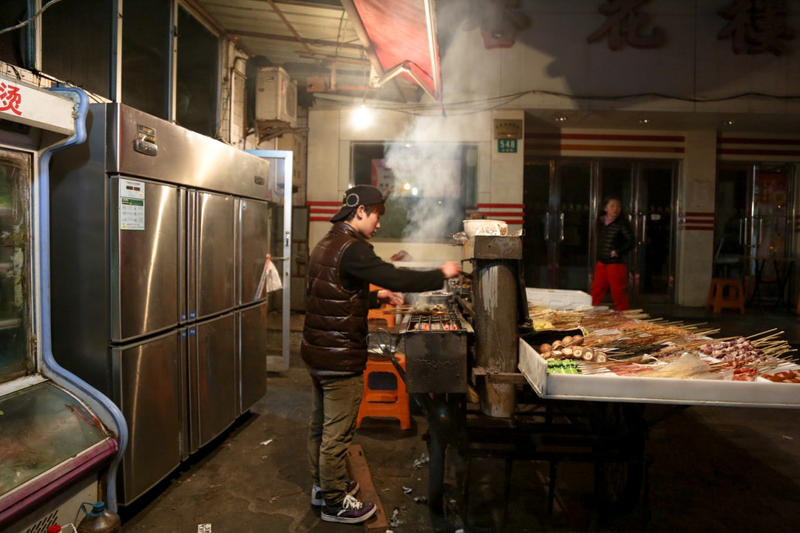 The eldest son works in the kitchen, which is detached from the restaurant and situated directly behind the chuar stand. Grandfather “the money man”. His wife didn’t want her picture taken. While eating at the stand you see a constant stream of plates and bowls going back and forth between the two buildings which are about 15 meters apart. The younger brother runs the chuar stand along with his father (we refer to as grandfather). The grandfather collects the money from the guests and delivers the chuar to guests at the pop up tables they arrange outside of the restaurant. If it is raining exceptionally cold outside they don’t set up the tables and all customers are invited to sit in the restaurant. The grandson acts as the entertainment source for all customers at the restaurant and chuar stand running around and jumping off ledges and tables. The child was shy when we first met this family and would run away to his mother when we attempted to talk to him, but over the months he has come to enjoy seeing us and will run over to us, as he is often surprised with an ice cream cone. The market itself is worth mentioning. We asked our family of vendors to show us where they get their ingredients and we had the youngest son take us to the market where his mother buys the ingredients daily. He showed us how first they walk around between all the vegetable vendors and pick out the biggest and best produce from each vendor to ensure that they are getting the best that is offered each day. This is done every day; however, other ingredients, such as meat and fish, are bought on a slightly less common basis ranging from weekly to bi-monthly. 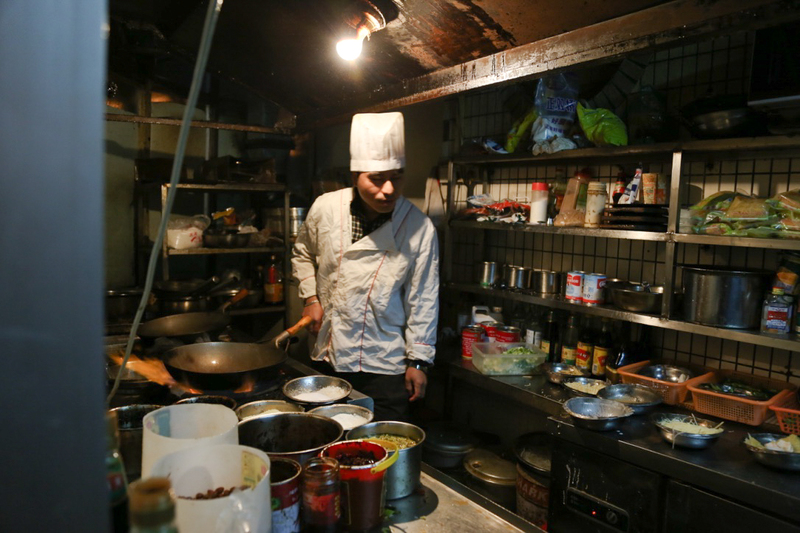 The rent for the kitchen restaurant and freezer space is 15,000 RMB per month and after paying this as well as the wages of the workers and the cost of food, they are able to make roughly 2,500-3,000 RMB per day profit from the restaurant. 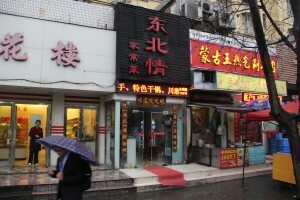 They are currently saving money and looking for additional space where they can open another restaurant in Shanghai. Money is still being sent back home to the great grandparents who still reside in the hometown. The youngest son hopes to save up money of his own and open up a “Big BBQ joint” back in his hometown where he will be able to work and raise his kids in the near future. He has currently saved up about 10,000 kuai for this. Know your market – Who are you selling to? Are you setting up shop in an urban part of town, where you know people will stroll along or stumble across in the middle of a pub crawl? Or is it a quiet part of the city with not much activity during sundown? Make sure you figure this out before you begin your culinary enterprise. Offer drinks alongside your food? (with a ridiculously high markup, of course). 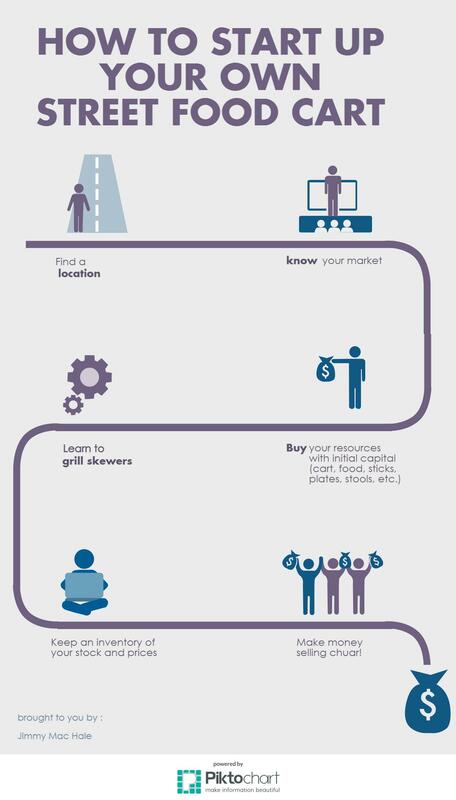 Learn to grill skewers – I guess this could fit at any step in the timeline. Also kind of a given. Unless you’re lazy, and are okay with nonchalantly giving your customers generous doses of food poisoning. Keep an inventory of your stock and prices – Here is where it may be a good idea to buy that 2000 kuai fridge; with it you can store some of the leftover stock/food from the night before, and if stored properly, you can reuse it the next night! This way, not everything you don’t sell is a waste, resulting in a loss of money. Also, a big thing is to adjust your prices accordingly. If your lamb skewer is 5 kuai and that is too expensive, perhaps lowering the price will increase sales of that certain skewer. Instead of letting it sit and rot for the flies to eat. That do not give you money. And if your chicken skewer at 1 kuai is always selling out, perhaps consider raising the price, so that you make more of a profit off of it. The key: ADJUST ACCORDINGLY. Make money selling chuar! – $ Cha-Ching! $ Use that money and improve your business! 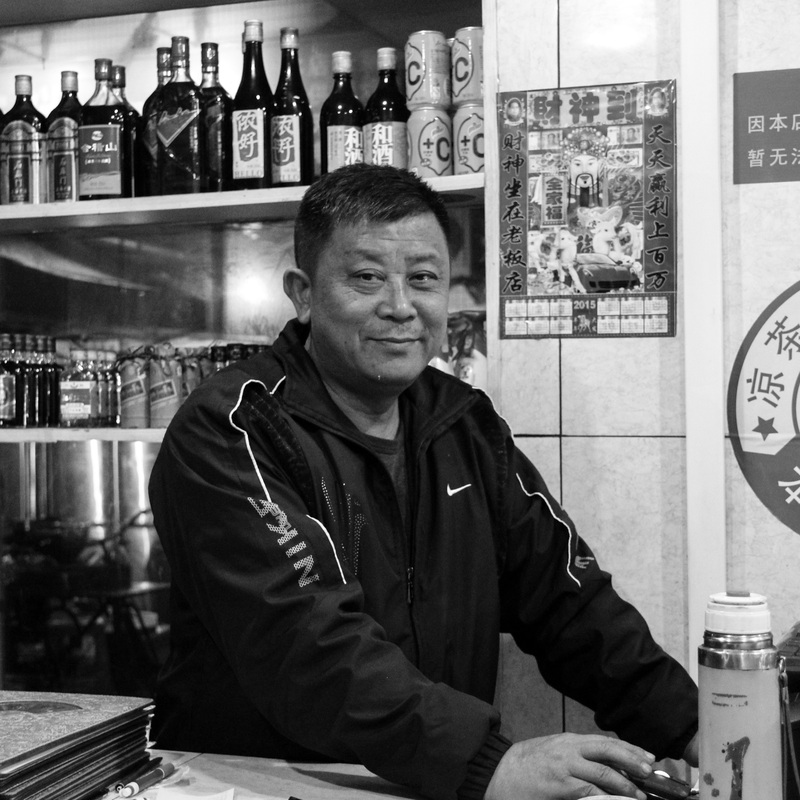 Who knows, maybe you’ll follow in the footsteps of the family we interviewed, and start a restaurant, with a daily revenue of around 4000 kuai! They started from the bottom, and now the whole team here! While the overall profit of 34,200 per month may seem like a large sum of money, one must remember that until recently this was used to support a family of 6 plus their family back home, and the money is earned in a difficult manner This sum must cover rent and food for the family, sent back home to cover the living expenses of the great grandparents, and finally saved so that one day they would be able to buy a restaurant. The vendor is standing outside for the entire night cooking food inhaling smoke, then spending the next day gathering new ingredients and creating the chuar. This is a full time job that is tedious work and drains individuals. After analyzing all of the costs that are associated with running a chuar stand, it is interesting that so little is spent on bread and vegetables. Everyone knows that meat is far more expensive than either of these two products but the vendors also sell exponentially more bread and vegetables than they do meat, yet they spend 300% more on meat per month. The skewers are also slightly more expensive than we had imagined going in. 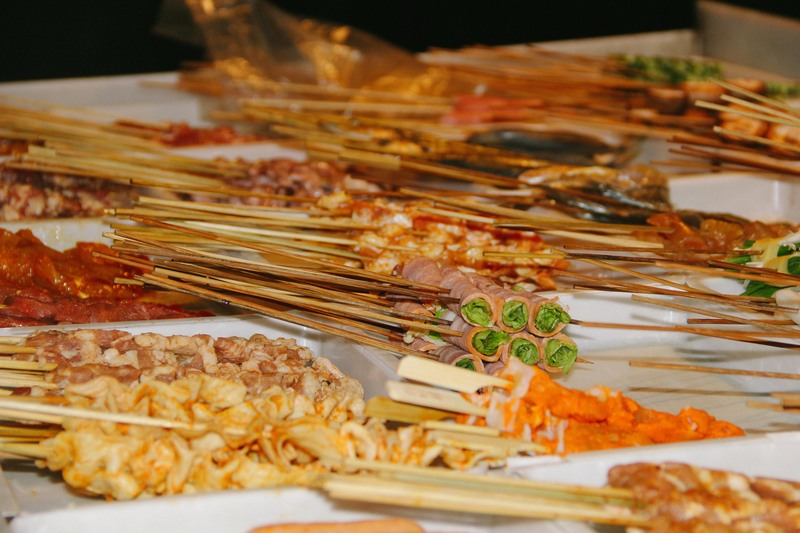 We initially estimated the skewers at roughly 1 fen each (.1 mao = .01 kuai), however we later learned they they actually cost about 4 fen each, leading to a total cost of about 6% of their total expenses. 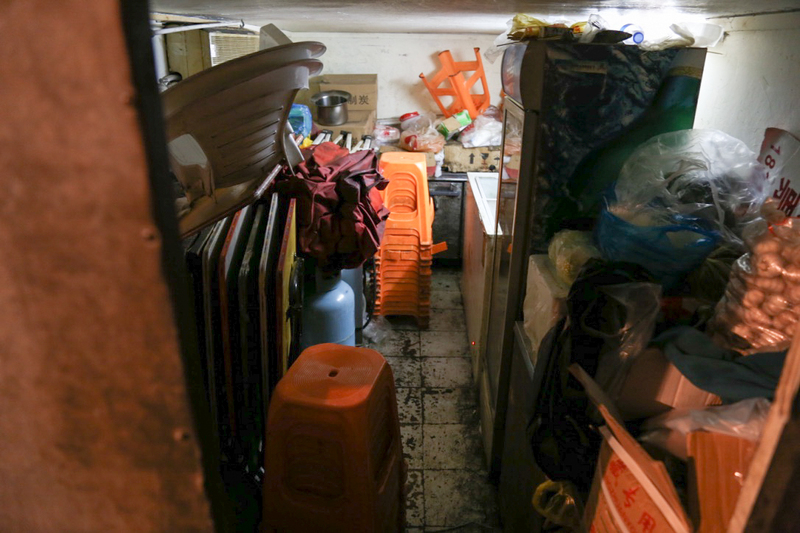 The storage costs for this family are slightly higher than that of other street food vendors in that they rent physical space to store their industrial freezers and fridges right next to where they set up their cart. 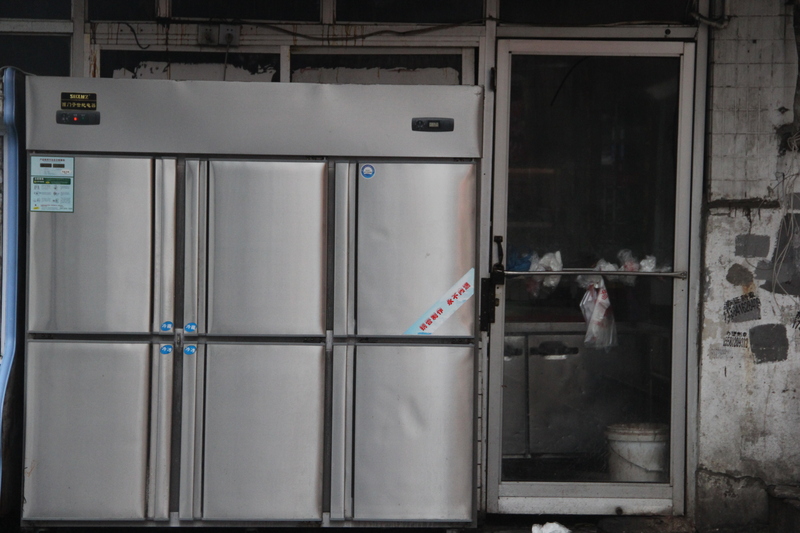 After interviewing other vendors we learned that they almost exclusively use freezers in their home and bring frozen chuar in boxes to the location, having to anticipate exactly how much they will sell that night. 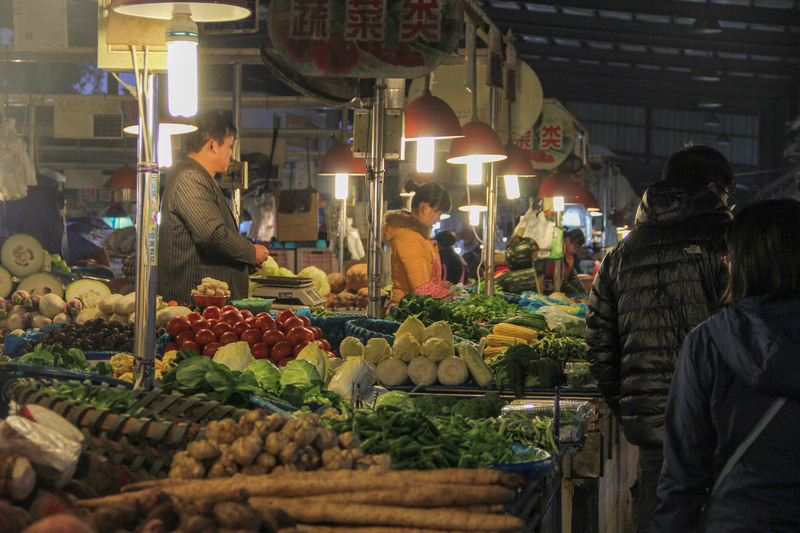 This leads to lower costs, but also causes many vendors to sell out of food. This family does not have any issues with this as they have ease of access to their storage facility. The family said that the cost of the storage space did not initially pay for itself financially until the purchase of the restaurant, but it did ease their lives and they said that this was worth it for them. 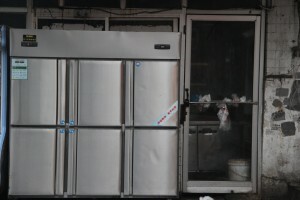 Aside from the initial cost of about 2,000 RMB (average of many street food vendors) for a freezer, most vendors do not have the same storage costs that are associated with this family, leading to higher margins and profit, but is something that makes this family unique, and unbeknownst to them may have partially led to their success. Their use of only the freshest ingredients and always having what customers wanted, never running out may have brought customers back time and time again. This paired with their kindness and willingness to engage in conversation brought us back to them. 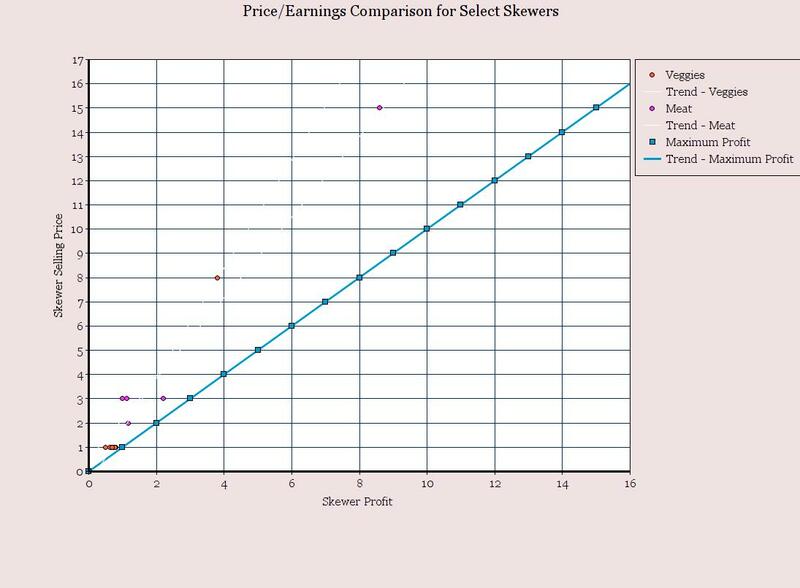 As represented here in this price/earnings comparison graph, where the blue line resembles the maximum profit line (a selling price of 5 giving a profit of 5) shows the profitability of each select skewer. The proximity to the blue line of each dot represents how profitable it is: the closer it is to the line, the more profitable. 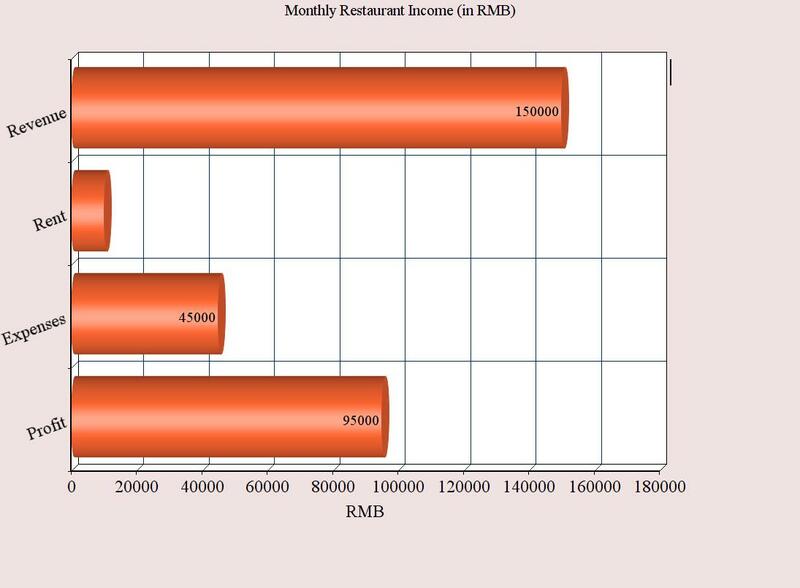 It turns out, from the graph, that the veggies, while generally cheaper in price to buy and to sell, generate a higher profit, as the chuar workers are able to charge a high markup for the amount of food they can stick on a skewer. For example, if a huge bundle of green beans sold for 6 kuai, they could make probably around 30 skewers from that, and in turn, about 30 kuai (price of 1 green bean skewer is 1 kuai, as are almost all veggies). Green beans were in fact the most profitable veggie (aside from the bread bun skewer). Veggies are incredibly cheap to buy, giving these chuar vendors their main source of income. But do they make more from the veggies or the meats? 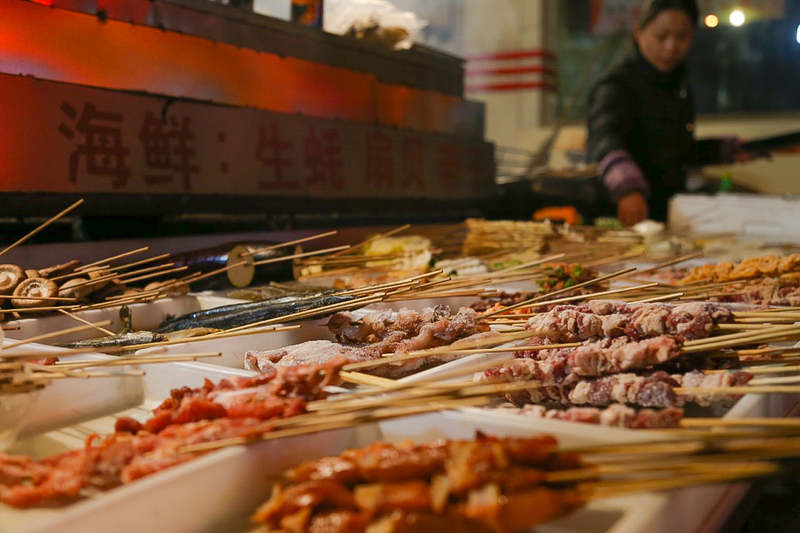 As for the meats, it appears that the meats tend to be more regulated in price, and the chuar vendors charge less of a markup for each skewer and in turn receive less profit from each one. The outlier of this graph, at a price of 15 and profit of 8.6 kuai, is the fish skewer, which literally is a whole grilled fish that you can eat for 15 kuai. They generate a lot of money per skewer from it, but the fish is also quite expensive, and so they do not make as much of a profit from it as the most profitable meat, the lamb (the dot located at a price of 3 and profit of 2.13 kuai). 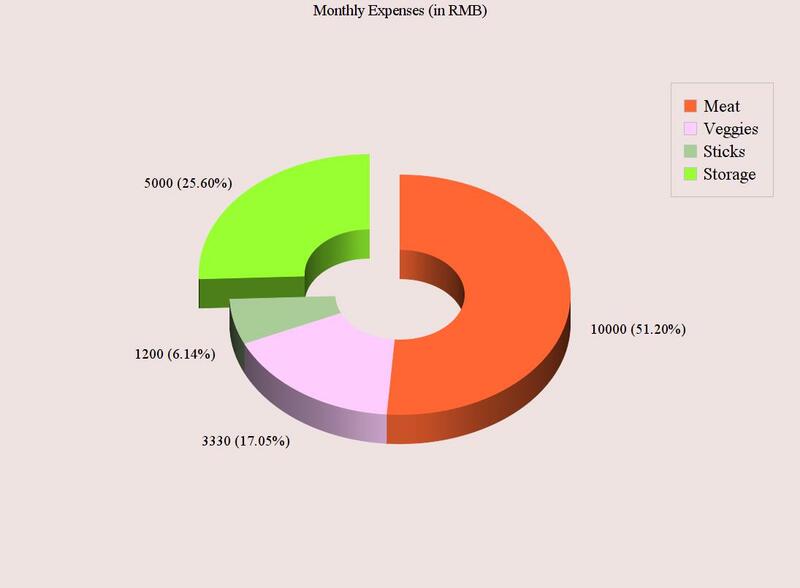 Through comparison, it appears that the chuar vendors get a high markup profit from the veggies, and less so from the meats, but combined with the expense charts from before, it is discovered that the bulk of their income actually comes from the sale of their meats. Because the vendors buy so much meat itself, it makes sense that this occurs. The street food cart was very successful for this family, and by saving the money they made from it, they were able to open up an even more profitable restaurant. 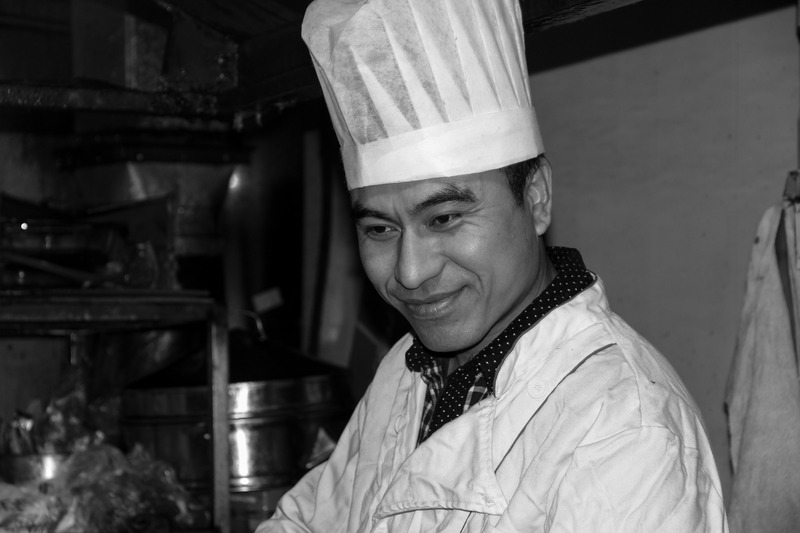 This restaurant combined with the chuar cart have created a very successful family business which continues to grow. The family now lives very comfortably and continues to grow their business. The family has told us that they are currently looking for more areas to open new restaurants. This is a great example of how small scale entrepreneurship was able to lift a family from poverty.